My yiayia’s favorite combination of greens for this pita, and what I use today, include dandelion greens, mustard greens and spinach. Add scallions, dill and parsley and the aromas of a Greek hillside will fill your kitchen. The flavors balance well so you taste the perfect bite of bitter with smooth sweetness. 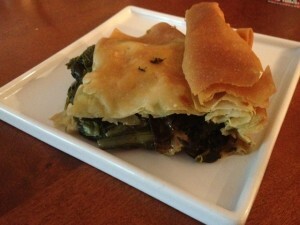 I use store bought filo dough. It’s a bit tricky, though certainly not impossible, to get the hang of working with so don’t make this for company your first time out! Each filo brand’s box has good directions to follow for beginners. I like to fold over the edges of filo that fall over the pan sides to make a bit of a decorative touch but just tucking your filo ends in is fine too. A good top and bottom number 0f filo sheets for a pita like this is 6 sheets on the bottom and 8 sheets on the top. I like to use a brownie pan (9×13″ with 2″ sides) to make a pita to serve 12 snack or appetizer sized pieces and 6-9 large or meal size pieces. It’s VERY important to score the top of the filo covered pita before cooking. Scoring uses a sharp blade to cut into the top layers of filo but not through to the bottom. This allows you to easily cut and serve the pita once its done without tearing through the flaky filo crust. This recipe uses approximately 20 cups of raw greens. These will wilt down significantly so don’t be alarmed when you start cooking. Chop the greens into smaller size pieces. You don’t want pieces that are too long in your pie. It just makes the pita harder to cut and eat. I use an old trick to temper the bitterness of the dandelion and mustard greens. Once the greens are chopped, salt the greens and allow them to sit for about 20 minutes. The salt will draw the most bitter juices from the greens – you should see the draining liquid at the bottom of the bowl. Rinse the greens well before adding to the pot. Oil each piece of filo well before layering them on top of each other. Pay special attention to the top sheet and make sure it’s well covered. It will help to give your pita a golden brown color. Once the pita is out of the oven and still warn, brush the top once more lightly with olive oil for pretty sheen. Chop greens and scallions into bite size pieces. Salt mustard greens and dandelions well, allow to sit for 20 minutes and rinse well. Finely chop dill and parsley. Heat olive oil on low in high sided pan or pot. Add scallions and cook until just tender. Add dill, parsley and salt and cook for 3-4 minutes. Add the chopped greens and cook gently for approx 10 minutes or until the greens are wilted down to about a third of their original amount. 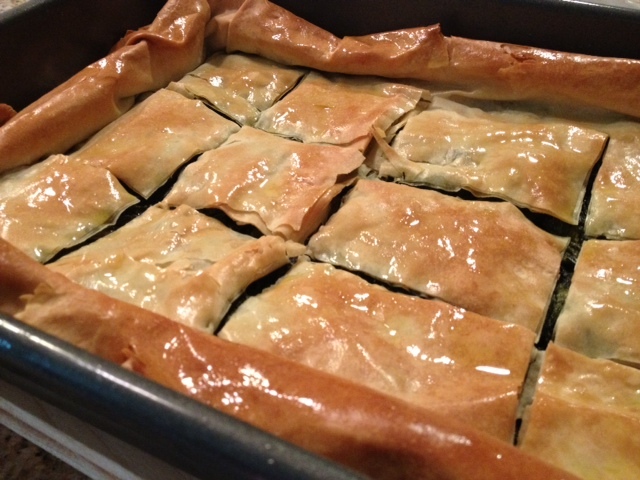 Remove pan from the heat and allow greens mixture to cool before adding on top of the bottom layers of filo sheets. Once the greens mixture is covered and the top layers have been added and scored, bake the pita in 400 degree oven for approx 30-35 minutes. At 20 minutes cooking time, open the oven and quickly, lightly sprinkle the top of the pie with water for a little bit of crunch. Allow pie to sit for at least 20 minutes after coming out of the oven. Serve warm or at room temperature. I have, unfortunately, never found a gluten-free fillo dough in my travels. 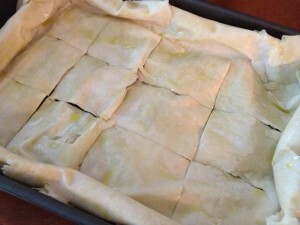 Nicole Hunn (glutenfreeonashoestring.com) has a recipe for gluten free filo/phyllo dough both on her website and in her book “Gluten-free Small Bites”. Absolutely Greek food is the best! 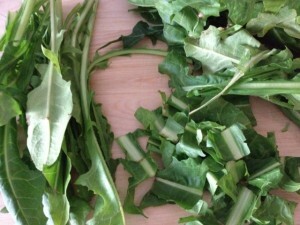 I have been using dandelions for juicing – excellent blood purifier. with the parsley and dill, I feel the taste, will linger in your memory.